In the Digital World, What is the Future of the Institutional Library? Today’s lead story looks at life at a prison library. 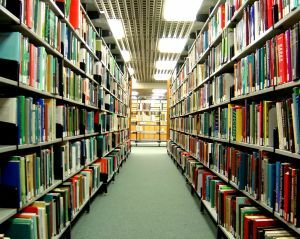 Numerous institutions — prisons, hospitals, law firms, magazines, intelligence agencies — have their own libraries and archives. Increasingly, these are eliminated to save office space and a eliminate what are seen as unnecessary expenses, particularly in an era when seemingly everything can be found via a simple “Google” search. But is that a mistake? What is being lost? History, context, identity even? When I started at Publishers Weekly magazine in 1999 as an associate editor, the magazine employed two librarians and the archives took up several hundred square feet of floor space. The shelves were filled with volumes, books, collections, archives, some of which dated back more than a hundred years to the start of the magazine, and all to do with book publishing. Later, when the magazine moved and a librarian retired, the library itself was reduced to a significantly smaller space (on a different floor of the building), many of the volumes were sold off, and the remaining librarian put on part-time. By the time I left in 2004, there was no librarian and the scant archives that remained were sequestered to a tiny conference room (albeit, on the same floor). As a researcher, particularly when starting out, I found those archives — many of which were clippings from old magazines kept in manila envelopes — invaluable. When they were gone, it was impossible to reference those early pieces of history, some of which provided important context for developing stories. Today, it’s all-but- impossible to find those same articles online. What is being lost with with the loss of these institutional libraries? The integrity of information is one: as anything can be altered or even deleted with the touch of a button. But there’s also institutional memory (which like human memory, is fallible), but provides a sense of identity and sometimes — in the best cases — as sense of history and purpose.